Every wedding is different! That is why I offer fully customizable packages to make sure I capture everything you care about for your day. All wedding packages start at $2000 and include six hours of coverage, personal printing rights, high resolution digital images, and professional photo editing. How much is additional coverage? How much time do I need? Extra hours cost $300 dollars per hour. Many couples choose to add one or two extra hours of coverage time, especially if they want more photos before the wedding getting ready or more photos on the dance floor. If you have a large wedding or large wedding party it is also advisable to add an extra hour of coverage. If your ceremony and reception are in different locations, it is also worthwhile to add extra transportation time. Feel free to let me know if you are not sure how many hours of coverage you need and we can discuss further! Can I add an engagement session? Yes! Engagement sessions are a great way to warm up in front of the camera for your big day. My typical engagement sessions start at $350 and include one outfit and location but if added to a wedding package are $300 and include two outfits and locations. This is a fun opportunity to go to a new place, get great save-the-date photos, and get to know me as your wedding photographer! Engagement sessions include over 100 high resolution digital photos as well as printing rights and professional editing. A second professional photographer is an additional $300 and highly recommended. If you are on the fence about adding an extra hour or having two photographers, I strongly encourage choosing the second shooter! This has a large impact on what you receive, greatly increasing the number of photos delivered in your final gallery. 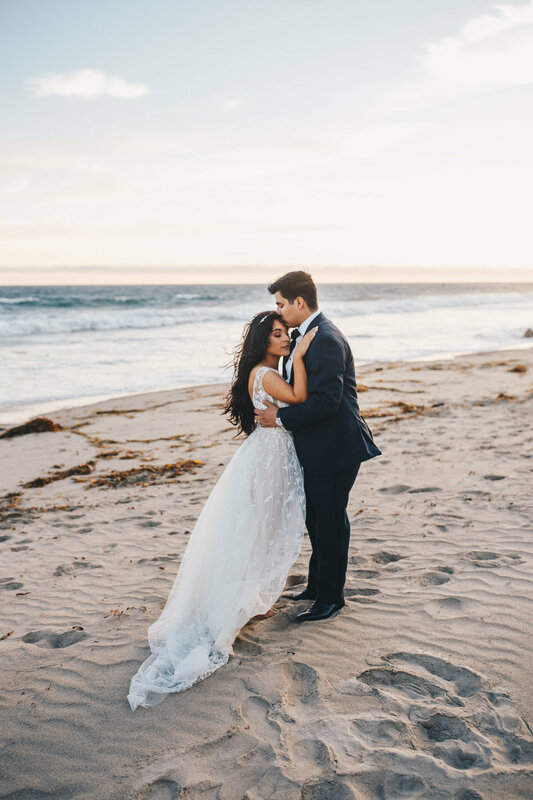 Having two photographers will also allow one to focus on the bride and one to focus on the groom, increasing the number of detail shots and decreasing the need for additional time. Do you shoot film at weddings or only digital photography? I love shooting film photos at weddings! You can add as many rolls of black and white film as your heart desires. Each roll adds $75 to your wedding package. Very few wedding photographers shoot film so this would be a unique addition to your day. Film photos will have a high contrast, high grain look and will be printed on gorgeous high-quality true silver halide prints by the Darkroom Lab in San Clemente, California. To see more examples of my film work, please browse here. Let me know what city your wedding is in - if you know your wedding venue already or have any ideas feel free to let me know that too!